-What do you want to do Rebecca? -Well, I sure don’t want to make another bowl. “Do you want to make something else?” he asked. “No. I’m just not having fun anymore,” I said. He had reminded us nearly every day that we were on vacation and we were there to have fun, so he understood my sentiments, but seemed a bit surprised – even a bit crestfallen. I went over to my lathe and pulled off the hunk of wood that had defeated me. I squirted compressed air over the beastly machine and swept up my plot of studio space as we did each night. My teacher sat in the classroom area a few feet away. It was the first time I’d seen him sit in the studio all week. I couldn’t look him in the eye. I finished cleaning, walked out, and burst into tears once again. There’s a fine line, I decided, between giving up and just not feeling it’s worth doing something anymore. 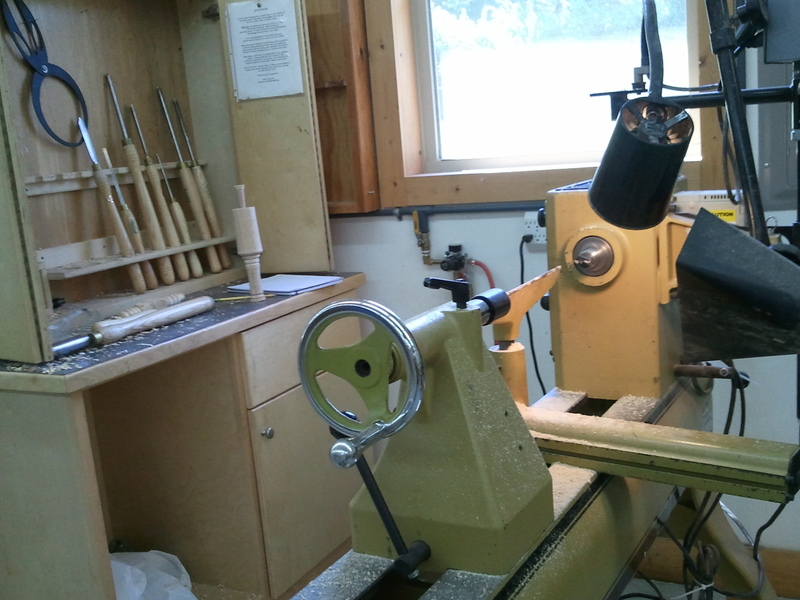 The next morning I headed back to the woodturning studio. On this, our last day, all I wanted to do was finish the projects we’d started earlier in the week. This was the first time in my life I’d been the last in the class, the slowest one. While the other students plowed away at new projects, I spent hours finishing the first two we had worked on. 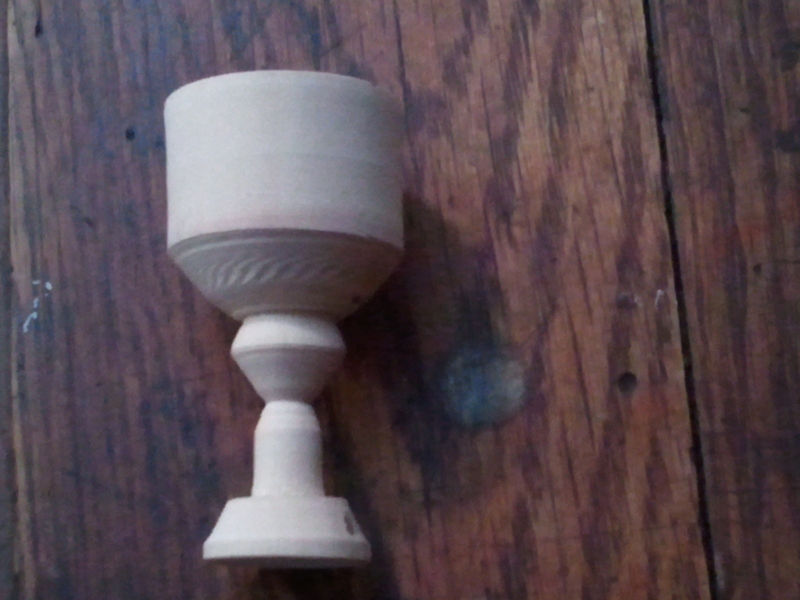 And as I was turning a stem onto my mini-goblet, I remembered how much I enjoyed doing this same technique the first day – experimenting with making beads and coves down a line of pine. Experimenting with beads and coves on Monday night. Bowls, on the other hand, were not something I enjoyed. So though I had spent the Thursday night reworking my entire class schedule to avoid wood or traditional “manly” crafts for the next three months, I changed my mind (as I so often do). I even told my instructor I might be interested in a class that focused on spindle work and not bowls. He told me which teacher to avoid – because he’s mean to his female students. Since I’d been near tears more than once in his class, I greatly appreciated his advice. This entry was posted in John C. Campbell Folk School and tagged cooking, Folk School, woodturning. Bookmark the permalink. Good for you! I’m glad you went back on Friday and paused long enough to figure out the part you did like. I had a similar experience with clay – unlike most folks, I do not enjoy turning on a wheel – I’d rather shape, pinch, scratch and chisel on a piece of clay with my hands. Sounds like you are having a blast – I’m definitely coming up to check this out before you leave! It’s good to know these things about ourselves:) And yes – please do visit! That would be fun. You had more guts than I would have had to tackle this class; now you know what you like (genealogy) and don’t like (woodturning) and it’s perfectly fine! so glad you went back in to tie up loose ends… that’s so very brave/ gutsy/ adult of you. 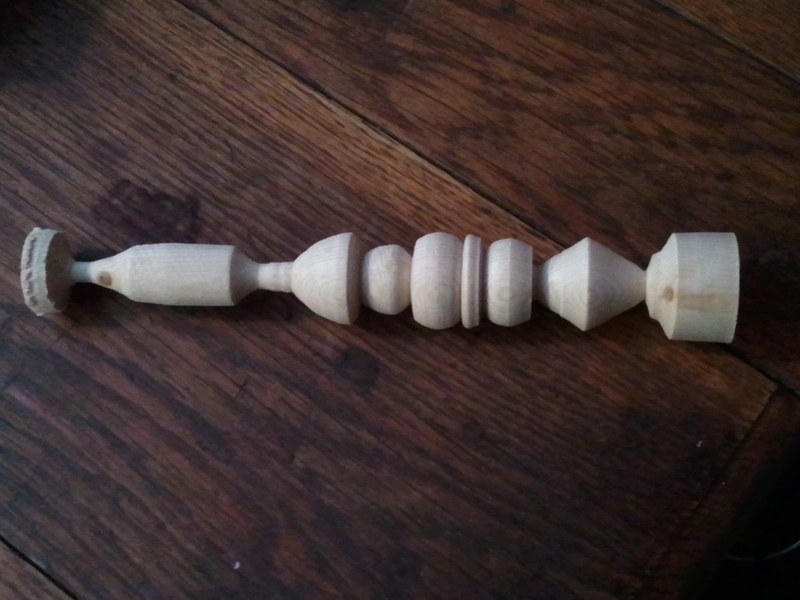 I’m going to text you a picture of a one of a pair of candlesticks my father in law has made. he’s amazing with a lathe and some wood and now i appreciate his skill even more, even if he doesn’t. love you and miss you! !